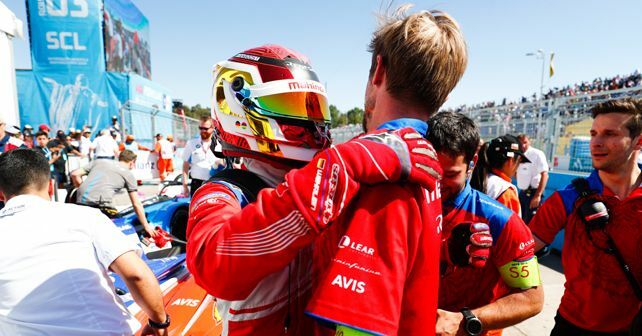 Despite a DNF in the previous race, Pascal Wehrlein went into the third round unfazed and proved his worth as he secured his first points of the season by giving Mahindra Racing their third consecutive podium finish at the Santiago E-Prix in Chile. Like the two preceding rounds, the third round of the ABB FIA Formula E Championship also witnessed an action-packed race weekend replete with incidents and investigations. However, despite all the chaos, Sam Bird (Envision Virgin Racing) emerged victorious at the Santiago E-Prix, followed by Pascal Wehrlein (Mahindra Racing), in the second position, and Daniel Abt (Audi Sport ABT Schaeffler) claimed the final spot on the podium. The first major upset at Parque O'Higgins involved Daniel Abt's teammate Lucas Di Grassi, who topped the qualifying session on Saturday. However, he was under investigation for allegedly breaching a new rule (formed after the pit-lane incident of the Marrakesh E-Prix) related to the slow in-lap procedure. Later, Di Grassi was disqualified from the top order as, the stewards confirmed his violation, relegating him to the back of the grid. Consequently, Sebastien Buemi (Nissan e.dams) became the pole sitter. With a strong fourth-place start, Bird maintained his position, as polesitter Buemi led the pack while under pressure from Wehrlein. However, by the end of the first tour of the Parque O'Higgins Circuit, Bird overtook Daniel Abt and moved into the podium positions by using the Attack Mode, just 11 minutes into the race. Later, Bird used his second Attack Mode on Lap 24 in order to move clear of Wehrlein, however, the gap between the two remained thin, not exceeding a few seconds. Things went in favour of Bird, as the deployment of two full-course yellows, caused by the on-track stoppages of Maximilian Gunther (Geox Dragon) and Stoffel Vandoorne (HWA Racelab), allowed Bird to close in on Buemi's tail. With Bird glued to his diffuser, the pressure soon became a bit too much for Buemi as, in an attempt to extend his gap from Bird, he locked up on the fast right-hander of Turn 7 and slid into the outer wall. As a result, Buemi limped back to the pits to retire his beyond-repairable Nissan. This handed Bird the race lead with 15 minutes left for the chequered flag. Wehrlein made good use of his final Attack Mode deployment, with just six minutes left in the race, to put race leader Bird under pressure. However, he had to call off his attack as his Mahindra M5Electro was suffering due to high temperature and, consequently, he had to look after his battery temperature in order to finish the race successfully. This gave Bird a much-needed breathing space and thus allowed him to claim the victory. Shortly after Buemi's crash, Andre Lotterer (DS Techeetah) crashed into the back of Antonio Felix da Costa (BMW i Andretti Motorsport), who in turn, ran into the back of Jean-Eric Vergne (DS Techeetah). While Lotterer was able to finish the race in 13th, da Costa and Vergne earned DNFs and were unable to see the chequered flag. Joining Vergne and da Costa in the DNF list were Oliver Rowland (Nissan e.dams), Buemi, Vandoorne, Gunther, Felipe Massa (Venturi Formula E) and Tom Dillmann (NIO Formula E), resulting in only 14 drivers crossing the finish line. While Bird and Wehrlein secured the top two spots, Daniel Abt was handed the final spot on the podium after a post-race penalty for Alexander Sims (BMW i Andretti Motorsport) for making contact with Edoardo Mortara (Venturi Formula E) on the exit of Turn 9. Despite the mid-race spin, Mortara secured a fourth-place finish and the first points finish for Venturi Formula E team. While Bird's teammate Robin Frijns rounded off the top five, last race winner Jerome d'Ambrosio (Mahindra Racing) was able to convert his 20th place start into an 8th place finish. However, he was then handed a five-second post-race time penalty for speeding under Full-Course Yellow (FCY) conditions, as he failed to reach the 50kph limit in the mandatory eight-second window. As a result, he was relegated to the 10th spot, earning a single point from the race. After round three, Sam Bird leads the overall championship with 43 points, while d'Ambrosio has slipped down to the second spot, just 2 points behind, with 41 points. Da Costa, Vergne and Frijns are all tied for the third spot in the championship, with 28 points each.